Inside: 25 frugal pantry items to stock in your pantry to keep your meal cost low and your grocery spending in check. Stocking your pantry with frugal staples is one way to keep your grocery cost down. I’m sharing my top 25 frugal pantry staples to stock. In this week’s podcast I’m sharing 25 staples I stock in my frugal pantry. When the ingredients you use to cook with are low cost your whole meal cost less to make. 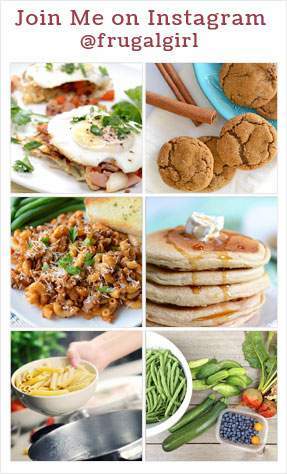 Scroll down and fill out the form below to get the printable version of these 25 frugal pantry staples. Oats are really versatile. I like to keep rolled oats on hand and oat groats. 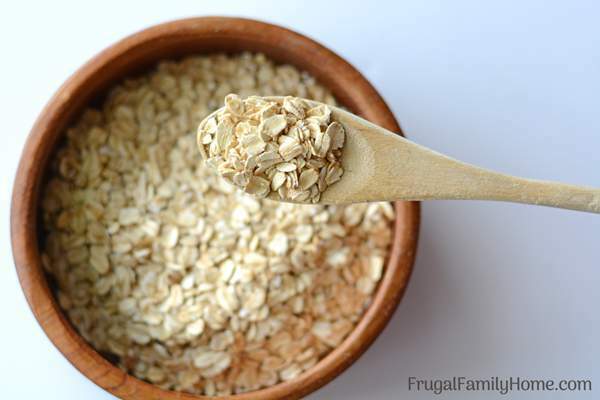 Rolled oats can be used to make oatmeal packets, as filler in meatloaf, or leftover oatmeal can be added to muffins or other baked good. The oat groats are a nice variation from the regular oatmeal for breakfast. Rice is really inexpensive. So easy to make and can be used in many dishes. Mix rice with beans for a yummy vegetarian burritos bowls. Serve it with stir fry using up the leftover vegetables in the crisper before they go bad. Or use leftover rice to make a bowl of rice cereal in the morning. Dry beans are a great frugal pantry item. After cooking a pound of beans you have the equivalent of about 4 cans of canned beans for a fraction of the cost. You can use them in soups, along with rice for vegetarian meals or add to a salad. I try to keep a variety of dried beans, split peas, and lentils on hand. Pasta may not be as cheap as rice or oats but it’s still a great frugal pantry item. We use all kinds of pasta in our dinners. It’s easy to store and great to include in casseroles. Eggs are so great for a frugal meal. You can eat them for breakfast, boil them and make deviled eggs for a snack. Or use the boiled eggs in an egg salad sandwich. Or make breakfast for dinner for a cheap and easy meal the whole family will love. 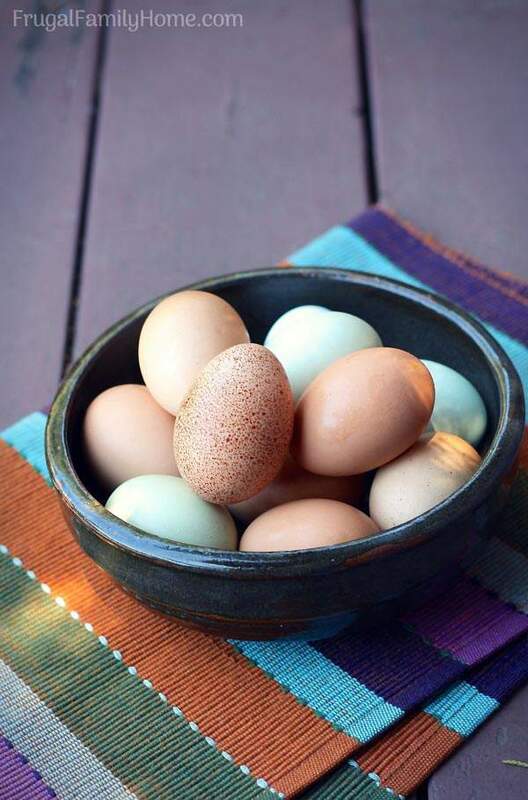 I usually pay about $.10 an egg so it’s a great frugal protein source to have in your kitchen. Yeast is something I always have in my kitchen. I use it in my frugal bread recipe, for making homemade cinnamon rolls or dinner rolls. Baking your own bread and other items at home is so much less expensive than purchasing those items at the store. Purchase yeast in bulk to save the most money. I purchase a 2 pound package at Costco but you can also find a one pound package at Winco Foods. Skip the small packages as that is the most expensive way to purchase yeast. I store a small amount of yeast in my refrigerator in a sealed container. I vacuum seal the rest of the yeast to keep it fresh until I need it. It keeps a very long time this way. If you are not using yeast in baking, then you will more than likely need baking soda or baking powder. This is another item I purchase at Costco. These items save me the most when I use them to make my own baked items instead of purchasing them ready made. I use baking powder in my muffins, quick bread, pancakes, biscuits, chocolate chip cookies, and more. Potatoes can be enjoyed any time of the day in so many forms. From baked to mashed and everything in between potatoes can be a yummy side dish. At about $.10 a pound, it’s an inexpensive item too. I purchase 10-20 pounds at a time and keep them in a covered box in our garage where they will stay cool. They last well this way and can be used in hash browns for breakfast. In a yummy potato and corn chowder for lunch and as a dinner of twice baked potatoes. 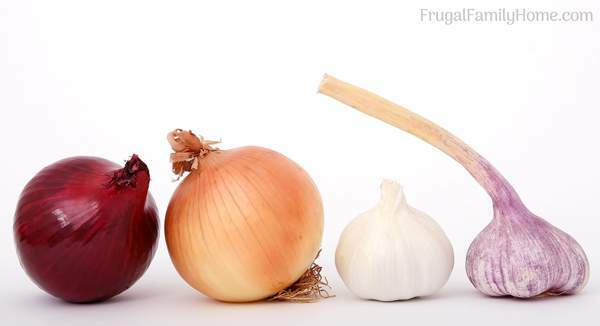 Onions are inexpensive and are added to so many dishes it’s hard to cook without them. They add great flavor to soups, stews, and casseroles. At about $.40 a pound, they are a good buy for all the dishes they can be used in. Onions can be stored in a cool area for a while but if you have a huge surplus you can also prepare them for dishes by slicing, dicing or mincing the onions and freezing them in the freezer. Flour is another inexpensive pantry item that can be used in so many ways. From baking to a thickening agent or even in mixes flour is needed. At $.30 a pound flour is a frugal pantry staple. Oil can be used to make popcorn, in baking, while cooking, and more. Oil is one staple I always have on hand. I often use oil instead of butter in many recipes to make it not only dairy free but less expensive to make. Having sugar, honey or molasses on hand can help you make more items at home instead of relying on more expensive ready-made items from the store. I used sugar and molasses to make our own pancake syrup for just pennies per serving. Sugar is needed in baking and when you make your own baked items at home you can really save. I stock up on sugar when I find it at or under $1.99 for a 4-pound bag. Cocoa powder is another frugal pantry staple that I keep on hand. I use it in brownies, for our homemade hot cocoa, and for making double chocolate baked donuts. I purchase it in bulk for about $.20 an ounce. Bone broth can be used in soups, stews, casseroles, and as a sauce base. You can purchase it canned or in boxes at the store but I like to make my own to keep the cost even lower. I use the bones from whole chicken or bones from a pot roast and make my own broth in the slow cooker. Then I freeze it in 1 cup portions or in ice cube trays for later use. I always try to keep some on hand. I’ll even make shrimp stock from the shrimp shells. Frozen vegetables and fruit are a great alternative to fresh to keep costs down. You can freeze your own vegetables or fruit from the garden to use later or pick up packages of frozen vegetables from the store. The fruit and vegetables are frozen at the peak of ripeness and they make a great alternative to out of season fresh fruits and vegetables which might be bland, tasteless, and overpriced. If you don’t have freezer room for frozen fruits and vegetables canned items are a good alternative. They are usually inexpensive to purchase and they are shelf stable, so no freezer needed. Tomato paste can be used in many recipes. You can water it down to become tomato sauce, use it to make ketchup or make pizza sauce with it. This is one tomato product I always have on hand in my pantry. 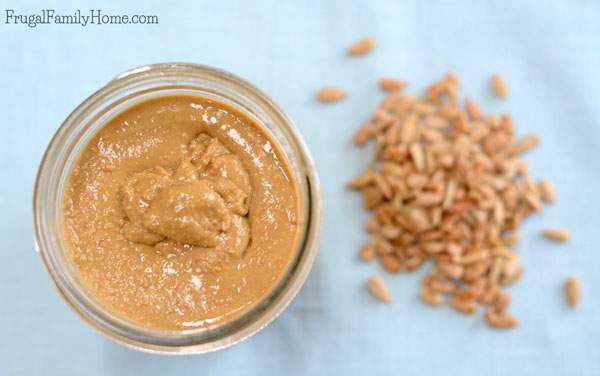 Peanut butter and other kinds of nut butter can be a great protein source that is less expensive than meat. We make our own sunflower butter to keep the cost down. I purchase peanut butter when it’s on sale and stock up when it hits its rock bottom price. Fresh or frozen fish can be expensive, so we purchase it sparingly. But I like to make sure we eat some sort of fish regularly. Canned salmon and tuna are great to use in patties or in casseroles. It costs a lot less than fresh or frozen fish. I used to purchase ground turkey or chicken on sale but recently it’s become more expensive than ground beef. I stock up on ground beef when I find it at $2.99/lb or less, I’ll buy more than 10 pounds at a time if I can find it for $2.49/lb. It’s great to use in a casserole, to make homemade hamburger patties, meatballs, and meatloaf for the freezer. Whole chickens can be a great buy if you can get them for less than $1 a pound. I’ll make herb rubbed chicken for the freezer so I only have to thaw and bake it. When your purchase whole chickens you can use the bones to make a wonderful bone broth for the freezer too. This is another frugal meat I purchase regularly at Costco or at the local grocery store. You can purchase a full pork loin for around $2 a pound and cut your own pork chops saving about $2 a pound. If you’ve never cut a pork loin before check out my pork loin for the freezer tutorial on YouTube. I stock a wide variety of spices to season our dishes. Even the most simple dish can really be made special with just the right seasoning. If you have a Winco Foods near you purchase your spices in the bulk food there and save money over the small bottles in the spice aisle. I like to keep an assortment of dried fruit on hand. It’s a great alternative to candy and if you have your own dehydrator you can make your own dried fruit with fruit you find on sale or u-pick during the growing season. If you don’t have a dehydrator Winco Foods has a nice selection of dried fruit in the bulk food section. Some of the links below are my referral links. When you use them I can make a little money at no extra cost to you. Thanks for your support in this way. 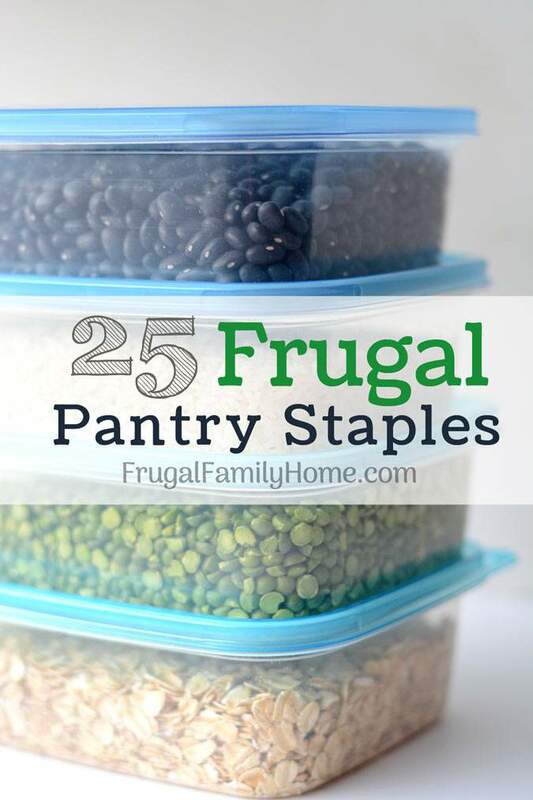 Want the full list of frugal pantry staples and ways to use each in a printable? Get it sent right to your email. Just fill out the form below. You’ll also be get weekly updates with recipes, frugal living ideas, and more. Don’t worry we won’t spam you and you can unsubscribe at anytime. What do you stock in your frugal pantry? Let me know in a comment below. Those are great additions to the list Casey, thanks for sharing. What a great list! I keep all these things on hand except for dried beans…I usually just opt for canned beans instead of making my own, unless I’m making a bean soup which has to cook for several hours in the crock pot. Where do you buy coco powder in bulk? Sara, I purchase the cocoa powder in the bulk foods section of Winco Foods. That’s a great item to stock in a frugal pantry, Pam. Thanks for adding it. Barbara, way to go, sounds like you have a great pantry to keep your food cost low. I hope you can find a small freezer on sale. 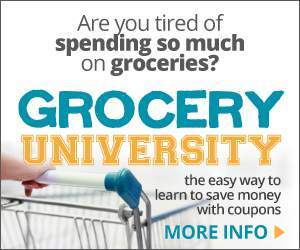 We love having ours and it does save us money for freezing items when I find them on sale. This is a good list! All good nutritious and versatile items! Thanks for sharing! Dried fruit as one that surprised me, but is a great idea! When my local Acme has chicken on sale I stock. It’s usually boneless and skinless. Best part about the sale…Buy 1 /Get 2 free. When they have their can vegetables on sale 3/$1.00 I stock up. I go to my local food bank 2nd Tuesday of the month. Whole chickens/legs thigh combo…sometimes 5/10 lbs rice…..goes right into my freezer to kill any larvae. This is how I stock up on alot of items. All great ideas, Flo. Thanks for sharing them.